As promised, I didn’t keep pace to post every single day this month, so this is an Advent post from a few years ago. I’m glad I resurrected this one. Preparing for the coming Christ means meditating on who He is and what He’s done for us. Here I recall how God turned my mourning to joy. Our Father is so good. Glory to God in the highest! Day 2. I’ve been in the car all day, driving home from Thanksgiving at the farm. As tired as I am, there’s no way I’m skipping the second day of Adventures in Advent! Especially since God has made this scripture real to me. Tomorrow is the last day of National Adoption Month. 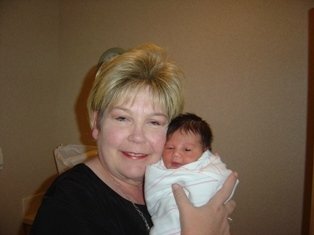 For weeks I’ve wanted to get some thoughts on my blog about our adoption experience, but time is at a premium and other topics were easier to tackle. As I looked over the second Advent scripture, I saw my experiences with adoption peeking out from behind the words. I know what good news is! Possibly, I know good news so well because the bad news was such a piercing to my heart. I was ten weeks pregnant when I went to my first OB appointment. Todd went with me, and we were so excited. Todd had spent months looking for a church job after graduating from seminary. The appointment was on a Monday morning, but the day before Todd preached at a church in Tulsa in view of a call to a staff position. The whole weekend had been one long interview, and we felt sure that this job was the one we had prayed for. Now we were off to see the first images of our first baby. Everything was coming together. A new job, a new home, and now the beginnings of our little family. I was going to quit teaching and be a stay at home mom. We had the world by the tail. The doctor was all smiles, offered an extra VHS tape since we hadn’t known to bring one, and I was all set up for the ultrasound and the first recording of our sweet little one. Maybe the reason I’ve held off on writing about these experiences for so long is that words just fail me when I try to describe that pain. I remember every excruciating detail, but to write it is to relive it, and maybe deep down, I don’t want to go back there. The doctor went from buoyant to business in a fraction of a second. Quiet and grim faced, he simply tapped my knee, saying to get dressed and come to his office. We, of course, were seized with fear. I remember my limbs going limp and clumsily going through the motions—tumbling into my pants, getting lost in my shirt sleeves, gripping my equally shocked husband, numbly making my way to a seat in another room. The doctor delivered the news factually but compassionately. He seemed particularly concerned that I not blame myself. Todd stuttered his way through a few questions—I couldn’t find my breath. It felt like I’d been body slammed. Then I was given a choice: I could schedule a D&C or wait until I miscarried naturally. At that moment, I was suspended somewhere between denial and complete despair. I just wanted out of there, to find a place where I could cry or collapse or scream or throw things or any other socially unacceptable behavior I chose. There is so much more to this story. I could fill a book. But for the purposes of this post, I’ll stick with what is relevant to our Advent passage. We went through this pain several more times—being told by a doctor that our baby had not survived beyond the seventh week. Those three miscarriages were particularly traumatic—the first two I ended up in the ER. But I believe that there were a number of very short pregnancies in between where I miscarried before I knew I was pregnant. So what does this have to do with Advent? For about five years, all we got was bad news. I wish I could tell you that these were years that were fruitful in my walk, years I spent pressing in, studying His Word and allowing Him to reveal His character during my times of suffering. Ha! Not even close. I was unbelievably angry with God. If He loves me, why doesn’t He heal this? It’s like my situation didn’t reflect what I thought was true of God, so I just held Him at arm’s length for a long time. I did not see any new revelation of God’s character because I wasn’t really looking. What I wanted was an answer to my prayer in the only way that I could see where the healing of my heart could take place. He simply had to give me a baby. Then one day, after four years of miscarriages and heartache, I started praying the right prayer. Instead of praying that God would give me a biological child, I prayed that He would heal me in whatever manner He chose. I just didn’t want to be angry anymore, and I wanted my relationship with Him to be what it had been before all this mess. I wanted Him to restore the joy of my salvation. One thing led to another that led to an adoption agency in Houston, Texas, called Alternatives in Motion. We waited a long year for the phone call. You know the one I mean? THE phone call! On the other end of the line was the agency director, Jan Deets. She laughed a little. “Katie, I’m saying this is your baby!” I’m not even sure what happened for the next few minutes of the conversation. Todd was on the phone in the bedroom, asking a few questions and getting all the details. I was too busy dancing! Finally! 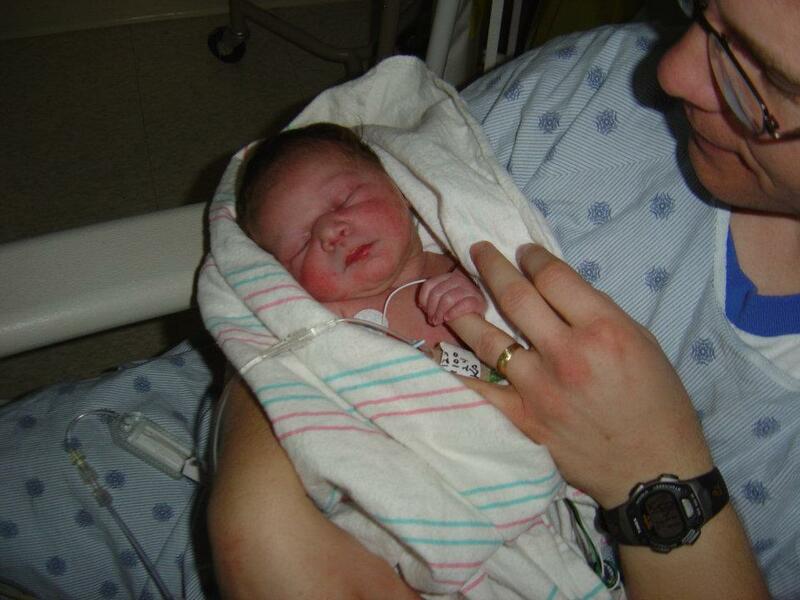 That’s Jan on the day we met our second daughter, Emma Kate. I’ve always loved this picture. Within a few weeks of having our sweet Eden home, I realized what God had done. He had revealed Himself through the adoption of our daughter. Even though I was a believer for a lot of years before, I now saw salvation in a different light—that God deeply, deeply loves me and made all the arrangements so that I could be His child. I had doubted for so long that God could work all this pain together for good. I had felt for so long that God was punishing me by not allowing me to carry a baby to term. I had grown accustomed to thinking of God as angry, and cold, and distant. But here He was showing Himself. He does good things! I pined for that baby for so long; finally I was able to bring her home, call her mine, and lavish her with love I’d been carrying for years since my first pregnancy. The good Rev with sweet Eden on day 1. This picture is another one of my all-time favorites. Isn’t that a beautiful picture of salvation as well? He pines for us, for our repentance, so that we can be forever in His love—never to be snatched from His hand. Todd and I went through a whole rigmarole in order to adopt—paperwork, interviews, workshops, and payments. But God made His payment for my adoption in blood—the blood of His own Son. And if I, being so imperfect, could so love this little baby girl who was only mine because of a legal document and the say-so of a judge, how much more could a perfect God love those for whom He paid so immeasurable a price? As for our scripture, Isaiah spent many pages describing judgment and exile, using words like fire and wrath. These people got bad news, over and over, unlike anything that we can comprehend. God’s people would not only hear the bad news in prophecy, they would live out its horrors. They must have doubted His goodness at times. They must have wondered if they had been forever cut off from His love. Imagine the joy, the expectancy, of a people who so suffered to hear their salvation proclaimed! Not only that, how they must have treasured the assurance that they belong to the God who reigns over all—and that every nation everywhere would witness their redemption. Guess what? If you are in Christ, these words are for you as well. Sometimes, the good news is best understood in light of all the bad that has gone before. None of what you have suffered has been wasted. Your God reigns, and He will return and comfort His people. Every nation everywhere will see what our God has done to redeem us. If you don’t know Christ, then know this–He wants to adopt you. You’ve been separated from Him because of your sin, but He’s pining for you. All the work is done, signed in the blood of the perfect Christ, who will buy you back from your sin. We celebrate His birth at Christmas, but it’s His death and resurrection that are the true tidings of comfort and joy!